July 5, 2011 -- If institutions aren't lucky enough to have relatively new CT scanners that produce DICOM Radiation Dose Structured Reports, patient dose monitoring can be a real challenge. Fortunately, several researchers and software developers are addressing this vexing problem. In talks at the recent Society for Imaging Informatics in Medicine (SIIM) annual meeting in Washington, DC, several presenters shared their approaches to dose monitoring, including techniques utilizing optical character recognition (OCR), as well as a method that relies on capturing dose information contained in radiology reports. Radiation dose has garnered significant attention in recent years, not only from the scientific community but also from agencies such as the U.S. Food and Drug Administration (FDA), Congress, and state legislatures. For example, California will start requiring radiologists to record radiation dose in July 2012, said Dr. Tessa Cook, PhD, of the Hospital of the University of Pennsylvania. This attention has spurred a number of dose monitoring and reporting efforts. But these initiatives have faced a number of challenges, primarily the traditional storage of dose-related parameters as pixel data on image-based dose sheets. This limits the ability to extract and analyze the data in large quantities, Cook said. And the dose-related parameters themselves are also not perfect measures. CT dose index volume (CTDIvol) requires conversion factors to map scanner output to patient dose due to factors such as patient size, composition, and shape differences, said Richard "Skip" Kennedy, technical director of imaging informatics of Kaiser Permanente in Northern California. And dose-length product (DLP), which measures the volume dose delivered to the patient, is less useful in studies with a limited scanning range. An estimated effective dose can be derived from the DLP value by applying the appropriate conversion factor for the anatomy being imaged. But it's important to realize that this estimate isn't the actual dose to the patient, but rather of the energy output of the scanner for the parameters that were described, Cook said. Medical physicists are actively working to develop more patient-specific dose estimates, however. Modality-specific issues aren't the only complicating factor. Few, if any, RIS or electronic medical record (EMR) software support appropriate dose data management, Kennedy said. But a number of dose optimization initiatives can help, including the DICOM standard's previous development of Radiation Dose Structured Reports (RDSRs). This format is used, for example, to transmit data to the American College of Radiology's Dose Index Registry (DIR), Cook said. Most new scanners can produce RDSR. The Integrating the Healthcare Enterprise (IHE) initiative also has a Radiation Exposure Monitoring (REM) profile, which has provided a guide to vendors implementing dose monitoring in their systems. "The way forward is clear," said David Clunie of CoreLab Partners. "All new equipment should encode dose in DICOM RDSR and all devices should support IHE REM, which addresses modality, storage, reporting, and registry submission." However, CT vendors are typically committing to provide RDSR capability only on current models. As a result, alternative dose tracking methods are required for the massive number of CT images with dose data contained on image-based dose sheets. Driven by the desire to start monitoring and tracking patient dose today, the Hospital of the University of Pennsylvania developed Radiation Dose Intelligent Analytics for CT Examinations (RADIANCE), a freely available, open-source software package that applies OCR technology to CT dose sheets to extract dose parameters of interest. These parameters are then stored in a database along with study information such as patient information, the scanner used in the study, the exam type performed, and the imaging facility where it was performed, Cook said. In its implementation at the University of Pennsylvania, RADIANCE also taps into the institution's RIS to record which technologist performed the exam and which radiologist read the study. If they don't have the current capability to generate a structured dose report, institutions interested in participating in the American College of Radiology's dose registry can now do so and send it to the registry, she said. In addition, a variety of dose analytics tasks can be performed, including implementing quality assurance metrics, generating regular reports, and tracking outliers. RADIANCE has been used at the University of Pennsylvania to process approximately 250,000 CT exams. Using that data for analytics purposes, a dashboard presents data in a number of different ways, such as by particular scanner, exam type, or a particular individual. RADIANCE protocol for capturing dose information. Image courtesy of Dr. Tessa Cook, PhD. At their institution, regular monthly reports or "scorecards" that summarize comparative analysis for each individual type of CT examination are sent out to all technologists, radiologists, and administrators. But while all of this information is valuable and has prompted a number of departmental dose reduction efforts, RADIANCE's initial implementation was only retrospective in nature; dose sheets from the previous day's studies were analyzed the following morning and then added to the database. The developers have since added a new module to provide radiologists with on-demand and real-time access to dose information at the workstation. A script was created to query the PACS every five minutes to look for any new CT examinations that had been delivered since the prior query. Once new studies are identified, their dose sheets were retrieved and processed by RADIANCE and then sent to the database to update the dashboard. After each CT exam is completed, dose sheets are now automatically sent to the RADIANCE server, which immediately parses them. By having real-time access to dose data at the workstation with the images in front of them, radiologists can identify opportunities for protocol optimization and dose reduction, Cook said. Based on the results, they can also gauge the effect of any imaging parameters that had been modified to customize the study to the patient, she said. Radiologists can also provide feedback to referring physicians about future imaging for their patients. The institution found that the new module led to only minimal additional load on the live PACS, affecting 10 to 15 CT exams per hour, Cook said. Only dose sheets are retrieved. RADIANCE does have some existing limitations, however. The real-time features have been tested with one commercial PACS and one open-source PACS application, as well as with one CT scanner vendor's dose sheets. "While RADIANCE is able to parse dose sheets from different vendors, probably some minor modifications will be made to enable this real-time application and share it with the open-source community," she said. In ongoing and future work, RADIANCE's developers are seeking to provide enterprise-wide access to the system at all three hospitals in their health system and to assess the impact of providing real-time access to dose information at the workstation. They would also like to use the data to educate residents, medical students, and technologists about the issues surrounding CT radiation dose, according to Cook. More information on RADIANCE can be found here. Lacking RIS or EMR support for dose data management, Kaiser Permanente in Northern California implemented a standalone enterprise-wide dose registry to comply with California's radiation dose recording requirements, said Kaiser's Kennedy. To accomplish this, the institution chose to add Dose QA Tracking (D-QAT) to its existing Technologist QA Tracking (T-QAT) system, which Kaiser Permanente had previously developed to track technologist procedural errors for quality assurance purposes. This allowed for leveraging of existing database tools and interfaces, including integration with the Kaiser Permanente's RIS and reporting systems. The standalone registry stores the CTDIvol and DLP values for every CT performed, a method that parallels the information available for every CT exam within the dose reporting screens currently, according to Kennedy. The institution had hoped to avoid using OCR technology but was forced to do so due to a lack of support for DICOM Dose SR and the IHE REM profile among its legacy CT scanners, Kennedy said. Dose report generated from D-QAT. Image courtesy of Richard Kennedy. 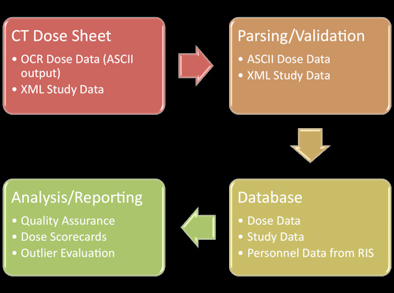 After the dose data are processed by D-QAT (either via OCR extraction or Dose SR), a structured content gateway allows the institution's legacy RIS reporting system to incorporate structured content into the report itself. From a desktop client, radiologists can access dose summary reports via a Web query as well as the internal registry for tracking purposes and retrospective analysis. Once its EMR vendor develops dose management capability, the institution intends to integrate the registry with the EMR. "We want it to be sent to the EMR," he said. "It seems like the logical ultimate consumer for this information." Another source for providing optical character recognition of CT dose screens is the PixelMed open-source initiative, which provides OCR, a toolkit, utilities, services, and registry submission capability. PixelMed's DoseUtility is a Java-based tool for querying, retrieving, importing, extracting, and reporting radiation dose information, according to Clunie. It captures DLP and CTDIvol per acquisition, as well as total DLP from CT dose screens and generates RDSRs from the extracted dose information. DoseUtility user interface. Image courtesy of David Clunie. When used in a "pull" model, the tool can poll a PACS at configurable intervals and retrieve unprocessed studies for a single day or a configurable number of days. If an RDSR is present, it can be sent to the registry; if an OCR dose screen is present, it's converted to an RDSR and sent to the registry. This model can also accommodate "push" or unsolicited processes. In ongoing and planned future work, the initiative will seek to support more vendors' dose screens, add extraction of size metrics, possibly determine effective dose and reference levels, and support new RDSR features, Clunie said. Support for other modalities including angiography, fluoroscopy, mammography, computed radiography, and digital radiography will also be added. In addition, the toolkit will support RDSR for nuclear medicine and PET as it develops, he said. More information on PixelMed and DoseUtility can be found here. As part of a CT dose reduction initiative, Beth Israel Deaconess Medical Center developed a prototype implementation of a semiautomated reporting and tracking system for dose report parameters, said presenter Rajeev Krishnapillai. Electing not to employ OCR due to challenges in parsing pixelated text and dealing with varying scanner formats, the institution chose instead to design software that would extract cumulative DLP information included in the final radiology report on the RIS, he said. The application also captures exam-related parameters and patient demographics. The parsing algorithm searches the finalized report for individual CT studies for any given patient for "DLP" and "mGy-cm" keywords. By finding study descriptors and validating with billing codes, the system can also identify study types. This allows for determination of a cumulative effective dose for each body part. A summary table presents the overall effective dose, enabling users to view the body area-specific effective dose and related dose parameters, according to Krishnapillai. Some challenges were experienced in rolling out the application, including enforcing radiologist dictation of DLP parameters in the proper format as part of the reporting workflow. In addition, the tool is usable only with already-existing dose information in reports, he said. There are also concerns over accuracy from relying on these dose estimates. "It's definitely not a gold standard, it's something of an approximation," Krishnapillai said. "We know that for sure, and whoever is using this information [has to be] aware that this is something that is an estimation, and they have to use it appropriately." What about GROK?!?!?! It gets radiation exposure data, assigns it to the anatomical region of interest, AND takes into account body habitus!! !